Theatre Week places are strictly limited and early booking is essential, so don’t delay – book today! Booking opens on January 1st each year for the following summer, and it isn’t long before our spaces begin to disappear quicker than Custard Creams from Mr. Hawes’ biscuit tin. Time is ticking, the countdown to Day One has begun… you know what you’ve got to do! We have limited spaces and our weeks often sell out quickly. If when booking you find your preferred week is sold out, please consider an alternative week or get in touch to be put on a reserve list. UPDATE: Weeks 1 & 2 are now both SOLD OUT!A reserve list is in operation for these weeks, call 03456 123 813 to put your name on the reserve list. UPDATE: Week 4 has just 10 spaces left! *Family Places are available for siblings in a single family booking. 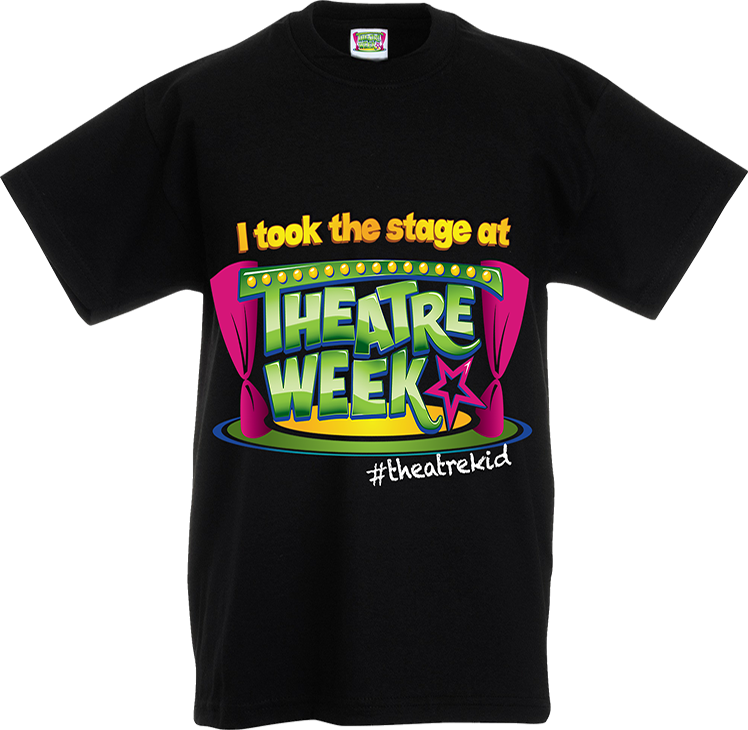 Our cool Theatre Week T-Shirts are not just a fabulous way of being part of the team and making the week extra exciting – kids love wearing them all year round! and available to collect on the first morning. Online bookings are taken at our Young Theatre Company webshop . When you book, we’ll send an email with your confirmation letter and Emergency Form (to be returned to us as soon as possible). If your confirmation email hasn’t turned up within 7 days, please contact us. For full terms and conditions of booking including our refund and cancellation policy, please read our Terms & Conditions. © Theatre Week Limited 2019. All rights reserved.